ENTWINED is purposely large and welcoming, with intentional space to support many people gathering together. These trees are meant specifically to be climbed upon, creating a direct physical interaction with the piece of art. It is a place for meeting, gathering, talking, and interacting. ENTWINED will draw people in at night and entrance them to stay beneath the waves of light in the jungle gym of roots, creating another social space. Meeting new people and telling them about your personal experience is an important aspect of the festival social environment. With ENTWINED, I seek to foster and inspire such interactions. The structure of ENTWINED invites you to interact with it and those around you. 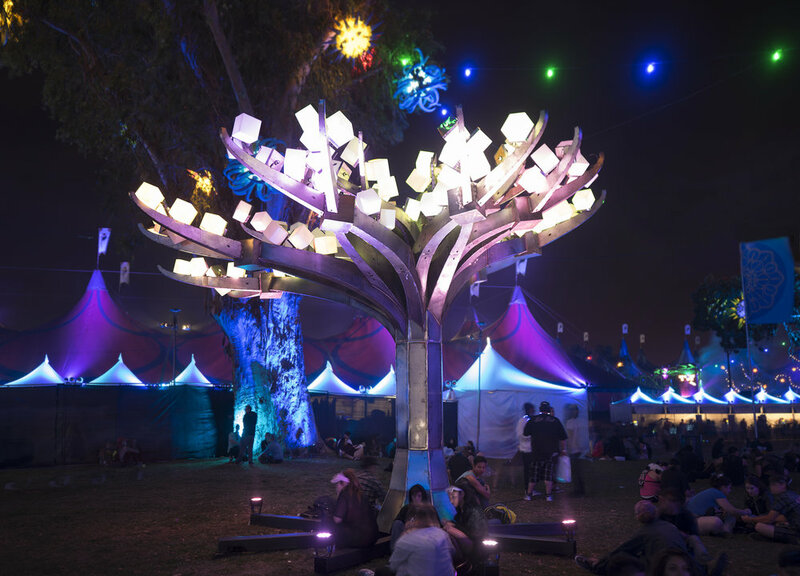 ENTWINED is a grove of five Africa-inspired trees with raised root tangles to climb and nestle into and a canopy of light cubes with interactive programming. It is a place to gather under shade during the day and to play at night. The trees and roots are made of steel plate in an innovative combination of CNC-cut and hand-rolled strips, to accomplish a finished effect that is simultaneously both curvy and boxy. The broad flattish canopies are made of 4” and 8” plastic cubes with individually addressable 16-channel LEDs. Millions of colors move through the trees' leaves in hypnotic waves. The raised root structure of the trees is lit underneath and provides a climbing surface and nooks to rest in and gaze at the light show. The trees will be spread out in a slightly curved line, with a spiral of metal root structure ~100ft long. The total footprint is approximately 75ft x 50ft. The beautiful colors will beckon across the grounds at night and be a totally immersive interactive experience. During the day, the grove forms a gathering space in the shade.